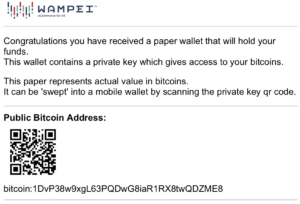 So you have a paper wallet from a friend, Wampei (a TipKit), Bitcoin ATM, or another source. Now how do you use it? 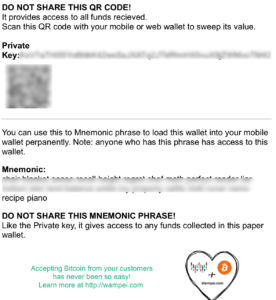 It is as simple a scanning the QR code and sending funds to the public Bitcoin address. When it all comes down to it, you probably don’t want to hold the BTC in the paper wallet forever. You want to spend it! Sweeping can be done at ATMs that buy bitcoin or on mobile wallets. You can cash out at an ATM or put it into a mobile wallet for spending directly or moving to a crypto exchange. As described in the video, open BRD, touch ‘menu,’ touch ‘preferences,’ touch ‘bitcoin settings,’ touch Redeem Private Key,’ touch ‘Scan Private Key’ button and the camera will activate, finally point the camera at the PRIVATE KEY QR Code. BRD will tell you how much BTC is in the wallet and confirm you want to sweep it.